Please avoid hard, sticky foods as well as foods and drinks with high sugar content. Stop bad habits (ie. nail biting, chewing ice and chewing on athletic mouth guards). See the attached list of good and bad foods. It is possible for brackets, wires, and appliances to irritate your cheeks, lips, and gums, when first placed or after more intensive adjustments. Soreness of the teeth can also be expected. Tissue irritation can usually be relieved by rinsing the mouth with warm salt water (1 tsp. in 8 oz of water). Wax can be used for tissue irritation, loose/broken brackets, and wire discomforts. Wax is available during regular business hours at the office front desk and in the kit we gave you when braces were placed. Tenderness of teeth can be treated with Tylenol as needed. If a bracket, wire or appliance becomes loose, do not become alarmed, as this happens occasionally. A loose/broken bracket IS NOT an emergency. Please call our office during regular business hours to schedule a repair appointment. Always call ahead to schedule an appointment so we can ensure enough time for the doctor to correct and accomplish all that needs to be repaired in one visit for you. Please limit the use of this number to true dental emergencies only. Leave a detailed message and an assistant will return your call as soon as possible. Emergency calls are taken until 8 pm. Calls received after 8 pm will be returned the following day. For non-emergencies such as loose brackets, scheduling changes, etc., please call the office during normal business hours. Appointments: It is imperative that ALL appointments are kept. This will help ensure optimal treatment results. Missed appointments: delay completion time. If for some reason you are unable to keep your appointment, please notify us as soon as possible. If by chance you do miss an appointment, please call for a new one as appointments are scheduled at least 4 weeks in advance. We will do our best to find an appointment time that works with your schedule. Each missed appointment may prolong treatment. Late Arrivals: In order for our team to keep all patients’ appointments running on time, we ask that if you will arrive more than five minutes after your scheduled appointment time, you call the office to reschedule your appointment. Every patient and appointment is important and we want to make sure we have the appropriate amount of time to spend with you. General Dentist Appointments: It is important to your oral health that you continue to see your regular dentist every six months for a checkup and cleaning. When you schedule your next dental appointment, please let us know and we will schedule two coordinating appointments. One to temporarily remove your wires pre-dental visit and a second to replace your wires soon after. Brush your teeth, braces, and gums for two minutes at least 3 times per day (after each meal and before going to bed). Daily flossing and regular use of fluoride rinse is expected. Poor oral hygiene or improper brushing technique can result in permanent staining of the teeth, plaque buildup, decay (cavities) and/or infection of gums. We want your smile to be amazing, so make sure your hygiene is too! Your teeth may be sore after getting braces placed, or new wires. Chewing might seem a little strange and may cause tenderness. We recommend Tylenol and a soft food diet for the first few days. Below are a few “soft food” suggestions to make eating easier while you are adjusting. To prevent tooth decay and decalcification during orthodontic treatment, it is very important to avoid sugary foods and drinks. It is also important to avoid hard and sticky foods. Eating these foods can loosen/break brackets and you may not discover the problem until hours or days later. HINT: If you think something is too hard or sticky to eat with your braces, you probably should avoid it! Remember, breakage adds additional time to your treatment! Food and Beverage high in sugar should be avoided during treatment. Soda, soft drinks, and juice are high in sugar and acid and can cause cavities and decalcification. Frequent consumption of sugary beverages will RAPIDLY cause your teeth to change color and decay. Sticky Foods such as taffy, caramel, starburst, etc. should be avoided as they can damage braces and cause tooth decay. Hard foods such as ice, jolly ranchers, jawbreakers, hard chips, and nuts can damage the braces and cause prolonged treatment and extra office visits. Chew carefully! Pizza crusts, bagels, breads and frozen foods can be harder on your braces than you expect! Foods that are bitten into such as meat on the bone or corn on the cob should be cut in to bite size pieces. Biting foods with your front teeth should be avoided as it will loosen/break your brackets. Decalcification is a serious matter, and is COMPLETELY PREVENTABLE with proper home care! Decalcification etches PERMANENT WHITE SCARS into tooth enamel. Proper brushing, flossing, fluoride use and elimination of sugary foods and beverages are a must! Improper and infrequent brushing allows bacterial plaque to build up rapidly, causing inflamed gum tissue or “Gingivitis”. Gingivitis causes puffy, bleeding gums. Food, sugar, acid, and bacteria get trapped under the pockets of inflamed tissue and erode tooth enamel leaving decalcification marks. Decalcification is the depletion of the mineral content of your teeth due to high amounts of acid and sugar, which are most commonly found in soda, sports drinks, and candy. Decalcification progresses rapidly and scars the tooth enamel. These scars are permanent and eventually become cavities. Proper brushing, flossing and fluoride use are a must. Eliminating acidic sugary foods and drinks is highly recommended during treatment. Sugary soda and energy drinks are the worst possible beverages to drink during treatment and dramatically increases chances of decalcification and decay developing during treatment. AVOID SODA AND SUGARY DRINKS! 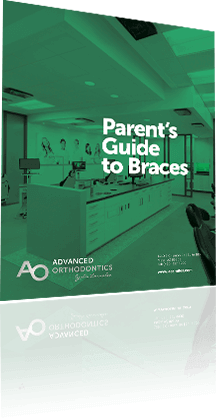 When upper and lower braces are placed, in many instances, the top teeth bite down and contact the lower braces. This may cause the upper teeth to ‘bite off’ the lower braces, and as a result, will cause extra visits to the office. 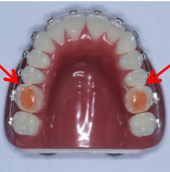 To prevent this and allow placement of upper and lower braces at the same time, we use small temporary build-ups called Bite Blocks on the biting surface of the rear teeth. Bite blocks are pink in color and are placed on the biting surface of your back one to two teeth. Two bite blocks are placed initially. One block is sufficient to keep the upper and lower teeth apart, but if one block comes off, please call to schedule a repair. Because your bite is being propped open, your back teeth may not fully touch. This is normal and expected. Start with softer foods that are easier to chew and work your way up to more solid foods. Cutting your food into smaller pieces on your plate first will also help. Remember that using these blocks to separate your teeth ‘unlocks’ your bite from the pressure of opposing teeth allowing them to move easier, faster, and more comfortably. Although bite blocks may be slightly annoying at first, the treatment time saved is well worth it in the end.